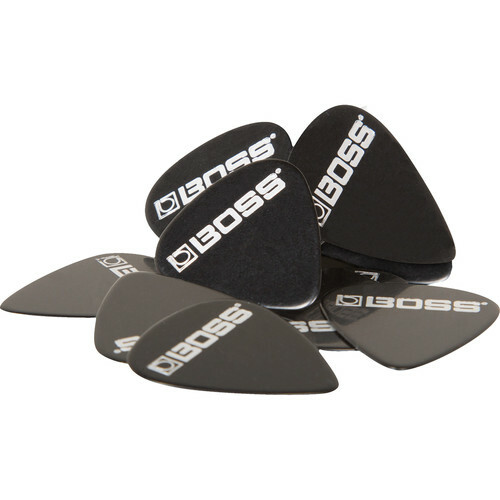 The 12-pack of black BPK-12-BT Thin Celluloid Guitar Picks from BOSS is manufactured with the highest quality American celluloid materials for great feel and playability. With a BOSS logo across the top, they're suitable for all styles, and feature clean, polished edges for easy control and a consistent tone. Box Dimensions (LxWxH) 4.0 x 2.5 x 0.3"
BPK-12-BT Thin Celluloid Guitar Picks (Black, 12-Pack) is rated 5.0 out of 5 by 1. Rated 5 out of 5 by Alda from Perfect Picks Perfect for playing fine, medium or hard strings on acoustic or electric guitars. Been playing since the 1950s and these are the best picks Ive ever used.